To start off with, I like to use Elemis frangipani monoi salt glow body scrub. With extracts of hibiscus, coconut oil, frangipani flowers and mineral salts it gently polishes the skin, seals in moisture and leaves behind a light floral scent. Unlike some of the exfoliators I've tried in the past, it's not harsh or scratchy but it's still effective enough to remove any dry patches, leaving my skin soft, smooth and ready for fake tan. For unexpected sunny days, it's good to have an instant bronzer on hand. And with Caudalie divine legs it really is a fuss free easy application. It's a combined body lotion and bronzer, so there's no need to moisturise before hand, and once blended in, you're left with very natural looking instant tan. I've yet to experience any streaking or colour transference, although I would avoid wearing anything too light just in case. 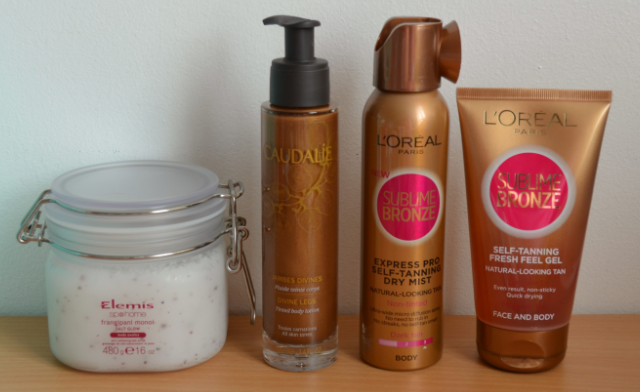 Finally there's the newly reformulated L'oreal sublime bronze range. It takes a bit more time and preparation, but because it lasts up to a week, it's perfect as a pre holiday boost. For a spray tan novice like myself, the express pro self tanning dry mist was surprisingly easy to use and thanks to the wide nozzle, great for those hard to reach areas too. I'm also loving the new self tanning fresh feel gel. It's not tinted so a tanning mitt is essential, but once applied, it's quick drying, non sticky and develops into a natural looking golden tan in just 4 hours. Are you a regular fake tanner? What are your top tips for a streak free even tan? I do fake tan quite often, currently testing out some St Tropez, after my years long obsession with Xen Tan, so a good scrub is more than necessary! I've been wanting to try out this Elemis one for a while now, so your review definitely means I'm officially adding it to my wishlist!